Cinecultist attended the New York premiere last week of Jim Jarmusch's new film, Broken Flowers and despite being a little dazzled by the celebrity/red carpet factor of the event (Sofia Coppola is a tiny, tiny woman), we actually tried to judge the movie on it's own merits. Outside of the fact that we'd chatted with Jim about his air conditioner before an interview conducted at our Day Job, or that we had an invite to the after-party or even that a few of our close friends had even worked on the film's production (apparently, Jim's a good boss). No, as the lights dimmed it was just the Cinecultist and the screen. As it should be, of course. 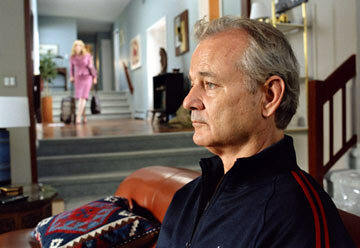 Bill Murray plays Don Johnston, an aging bachelor whose most recent girlfriend (Julie Delphy) leaves him the same day a mysterious pink envelope arrives informing him that he has a 19 year old son who may or may not be trying to locate him. Don's amateur sleuth and settled family man neighbor (Jeffrey Wright) convinces the melancholy Don to plan an elaborate multiple city trip wherein he visits each of his former flames who could potentially be the mother of his alleged child. But even with these plot details neatly laid out, it's important to acknowledge that for Jarmusch this "detective" narrative is entirely a MacGuffin. A MacGuffin is a fancy film critic term used usually by Hitchcock scholars to describe the plot lynchpin around which the story revolves but which is actually just a ruse, an seemingly consequential detail that actually isn't, designed to draw the viewer into the action. To have these many girlfriends, to have this pink letter or even the nosy neighbor are all excuses for Jarmusch to put Murray into various poses and locales where he can contemplate him with the camera. Which is not to say that the performances by each of the actresses who play the girlfriends (Sharon Stone, Frances Conroy, Jessica Lange and Tilda Swinton) are inconsequential or even that the various other supporting players (Alexis Dziena, Chloe Sevigny and Pell James) should be written off completely. Certainly they all evoke nuance within their short scenes and bare sketches of characters, though at times it does devolved into a bit slapsticky in its obviousness. All this fuss is lovely and exists but as the foil to Murray's most Eeyore-meets-Droopy-the-Dog performance yet. He's a man wounded by a life's worth experiences and yet he still retains the ability to naively believe he could connect. If only. Certainly there are bits of the whole thing which don't make a lot of sense and Jarmusch leaves the ending intentionally vague. Like the obvious and yet disavowed connection between Don Johnston and the mythical Don Juan (Don watches an old movie version of Don Juan. People keep thinking his name is Don Johnson, like the actor, who was a sort of Don Juan.) How could a guy who seems this sad, who reaches out so little actually have this many hot girlfriends? Did these women just throw themselves at him? Regardless though, Murray is so very compelling on screen it seems worth it to revolve such an elaborate game around what he can do. He barely needs to speak, let alone show emotion on his face and yet he communicates so much. It seems paradoxical that so much could be supported or surrounded by so little and yet Jarmusch carries it off. There's not a lot of there there and yet, it's all there. If that makes any sense. Or maybe like Jim, we'll just leave it at that.